Hi, I’m Steve. I’m doing a tiny bit of technological jiggery pokery for the folks who normally entertain you. To make sure it works, I’m writing this. If it does, I won’t need to bother you again. If it doesn’t, I shall cry, and then perhaps bug you at least one more time. Just a quick note before I begin writing. Yesterday I decided to combine “Life and Its Challenges” with “Ruled By Paws” so you will notice some new, but old entries have appeared. 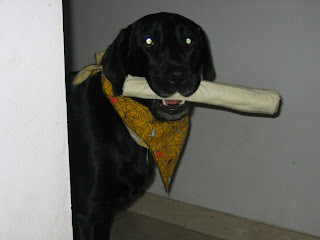 When I started “Life And Its challenges” I thought it would be nice to just have a blog dedicated to my personal life and thoughts so they wouldn’t seem strange amongst all of my dog entries, but I just found it hard to keep the dogs separate at times and also didn’t find I had as much to say on a personal level. So, now you will get more of a glimpse into the lives of Huib and myself, instead of just the parts which pertain to our fur babies, as some like to call them. This morning I’ve been listening to the Lithium channel on Serious radio and the song “What Its Like” by Everlast got me thinking about how some songs just never lose their effectiveness. “What It’s Like” is about how society is too quick to judge people. It looks at the lives of three different people and the chorus continually reminds the listener that if they knew what it was truly like then they wouldn’t be so fast to label. Even though this song was written back in 1999, the meaning behind the words still causes listeners to pause and reflect about a social issue which remains unchanged. There are other songs which come up on the radio from time to time that get me thinking about their meanings and how even with time the message rings true. Are there any songs out there which make you stop and think? As usual, I haven’t posted a memory in a while so here comes one now!! I’m sure you all know where this post is going, but just in case you’re still in need of your morning coffee, I’ll give you a little clue…POO!! Phoenix is the pooping king. He will poop more times in a day than any other being in our home. He does not care where he is, if he has to go and he can’t get your attention, then he’ll just drop his load. Luckily with the raw diet though, his stools are quite dry and easy to pick up. But, I do remember his working days and wanting to die, because he decided it was a good idea to drop a load in front of a crowd of unsuspecting mall goers. I used to dread going into malls with Phoenix. 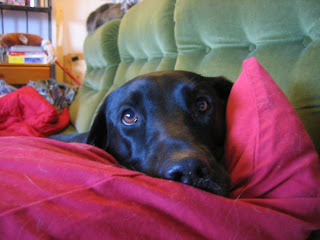 It did not matter how many times he pooped before we arrived or if he had eaten before we left home – it would happen!! We’d be walking along, doing well I thought, and then….he’d begin to slow a little…and before I could react….he’d do it!! I don’t know how many times I’d look around to see if anyone noticed, only to find out we were standing right beside a table of people eating their lunch in the food court. He didn’t keep these little surprises for just the mall either! I also hated taking him to visit friends and family because I knew they would end up convincing me to let him off leash, only to later find out he had left a present in their basement or once in a little girl’s bedroom!! Phoenix’s pooping in public got to be so frustrating near the end of his working career, that I was actually sort of relieved when he decided it was time to throw in the towel and spend his days relaxing on the couch. Phoenix is not the only one in our household who has left a family member an unexpected surprise – Cessna is just as guilty. Cessna is a little more finicky about where she deposits her treasures, but for some unknown reason, she has left my aunt’s guy friend more than just one present in the only room of the house he does not allow his own dogs to enter. I have never worried about allowing Cessna off leash when visiting or wondered if she would squat in the middle of a public place – she is a reliable reliever. But, after Dean entered his living room to grab a coaster and found a neat little pile of Cessna logs, I’ve been a little more cautious. We’ve been really lucky with Canyon thus far. He has not once had an accident that I can remember in someone’s home, but with Aspen….luck hasn’t really been on our side. Jess from At A Glacial Pace will remember this one! When Aiden was about 8 months of age, Jess and her roommates invited us to come with the dogs for Jetta’s retirement party (I think). Well, my sister was living with us at this point in time so we decided to leave Phoenix at home and bring our other three; Cessna, Aspen and Aiden. Well, Aspen had been having some stomach issues that day, so we probably should have left her home, but thought the Immodium we had given her would keep her belly happy enough – we were wrong!! We arrived before most of the other guests, so Aspen took this time to get in as many Auntie Jess snuggles as possible. Well, I guess her belly began to bother her so she got into Jess’s lap in an effort to get Huib’s attention, he was sitting in a chair to her right, but before anyone knew what she was doing….her bowels let go! Huib grabbed Aspen and ran her outside, while I caught the other two, so Jess and her roommates could get everything cleaned up. I couldn’t stop apologizing and so desperately wanted to crawl under a rock and die! I know it wasn’t Aspen’s fault, but how many people can actually say their dog has pooped in a friend’s lap? Aspen has had bowel issues since a very young age so, we should have known something like this could happen. Here’s a final Aspen story to further spoil your breakfast. When Aspen was a year old, we were still working on the whole house training because of her overly sensitive bowels. Well, my aunt bought me a huge bag of Jelly Belly’s for a graduation present and stupidly, I left them on our coffee table while we ran out the door for the ceremony. Aspen had been doing quite well with staying alone, so I didn’t think twice about crating her. When we arrived home in the afternoon, my sister immediately saw the empty jelly Belly package on the living room floor and brought it outside for me to see – I had been letting Aspen out. Well, she didn’t seem to be having any issues and her breath smelled absolutely delicious, so we weren’t too worried. That night, I woke up to the smell of poop. I got out of bed slowly and tried to find the source, but was unsuccessful so woke Huib. He looked around for a good five minutes and just before giving up, found it! It wasn’t on the floor, but on top of Phoenix’s crate!! Now, I’m guessing you’re thinking the same thing we did, “how the heck did she get up there?” Well, we had a pretty small bedroom back then so had a Rubbermaid container sitting between the end of our bed and his crate. I guess she had to go, so thought she’d climb up there and poop while looking outside lol! We had been working so hard on teaching her not to poop indoors, that I guess she decided this was the best option since she couldn’t wake us. Well, she didn’t get in trouble that day because first of all, we couldn’t stop laughing, and second, we thought it was pretty smart. I hope you enjoyed reading about our messy adventures and hope we didn’t ruin your breakfast! Canyon and I had our second training session with the Border Collie lady and she seemed quite impressed with our work. Last week’s session wasn’t overly successful, so I had really tried to practice what she had taught us, so she wouldn’t think we were a waste of her time. Last week he was really distracted by all the smells left in the room by the other dogs before him and really didn’t seem interested in working for me. This week he was still a little distracted, but at least tried to pay attention to what we were asking him to try. I cut up a couple of chicken hot dogs and cheese strings, so I think he felt it was a little more worth his while. What really got his attention off the smells in the room though, was a small ball on a rope her husband was playing with, so she asked him to toss it over and we used that instead of the treats for some of the more difficult tasks. This week we did a little more of the “touch” cue – not Canyon’s favourite – and then moved on to using his desire for whatever I had in my left hand to start teaching him a bit about the “heel” and where he was expected to be positioned. I’m not a huge fan of lure training, but Canyon doesn’t really offer many behaviours so if luring him works, I guess that’s what we’ll need to do until he understands what I am asking for. For getting him into the “heel” position, the Border Collie lady had me hold the little ball on a rope in my left hand and bring it from Canyon’s nose area (he was standing in front of me) to behind me, in sort of a counterclockwise circle motion so he’d turn his body and he’d end up straight at my hip – I hope this makes sense. He was quite excited to get a chance to play with the ball so eagerly followed my left hand into position. Once he was in position, she had me take a couple steps and then when she clicked I threw the toy for him to go fetch. I need to work on my positioning when I’m bringing him around my body, but otherwise we did quite well with this exercise. After a bit of “heel” work, we moved on to practicing some “down-stays” and “sit-stays.” Canyon’s “down-stays” are really good because we practice them while playing fetch so that Aspen and Cessna have a chance to retrieve as well, but his “sit-stays” need some work. For this part of the lesson we just used the hot dog and cheese because the toy had him too riled up. I think that’s about all we worked on, but I thought we covered quite a lot in just 40 minutes. We meet her for half an hour after her classes on Tuesdays because of Huib’s work schedule, but she finds we cover more than she can in her full hour lessons. I’m not sure what we’ll learn next week, but she has asked me to make a list of some of the things I’d really like to teach Canyon – any suggestions? In an earlier post I briefly mentioned Christina and her former autism service dog, Spencer. I’m now going to share the story of this little angel and her ongoing fight for life. 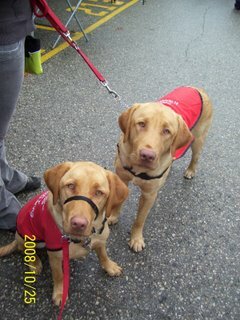 We first met Spencer (now retired), at an Autism Dog Services puppy training session in Waterloo with a 3 or 4 month old Aiden. At the time, Spencer was staying with the program trainer in order to learn what he needed to do for Christina. I remember being given a chance to walk with Spencer and thinking about how lucky this little girl, I did not yet know, was to have him in her life. He was so attentive, confident and wanting to learn. Fast forward 9 months or so and I got a chance to meet Monique, Christina’s Mom. From the moment I met her, I knew we’d become friends and stay in touch. Monique is an amazing woman. She wants what’s best for her daughter and isn’t afraid to make things happen. When we first met she asked a lot of questions about how we could raise a puppy knowing it would someday leave us for a new family. She listened to what we said and tried to understand why we were doing this. Throughout the outing she’d come over and comment on how well-behaved Aiden was and how she’d love to trade him for Spencer – he liked to give Monique a hard time. We met Monique a few more times and began keeping in touch. Several of the above characteristics are also present in the diagnosis of Noonan’s Syndrome, so it is understandable that it took doctors time to figure out Christina’s true diagnosis of CFC. CFC was a tough diagnosis to accept, but christina’s family is finding it even harder to deal with watching their little angel struggle to survive the numerous seizures that are taking a toll on her little body. Christina has been put on several different medications and is currently on a Ketogenic Diet in an effort to provide some relief, but nothing seems to work. Recently, they were informed of a life-saving alternative, the Vagus Nerve Stimulator, but their excitement was short-lived because they were informed that Toronto’s Sick Children’s Hospital is only able to perform 8-10 procedures a year. This is not because they don’t want to do more, but because OHIP doesn’t cover the units and the money must be taken out of the Hospital’s own surgery budget. This news does not sit well with Christina’s Mom, so she has taken it upon herself to begin writing letters to Ontario’s Minister of Health, hoping something can be done to rectify the situation. It’s hard to understand why a life saving surgery wouldn’t be covered, but something like a Gastro Bipass would be approved without a second thought. I’m not saying the Gastro Bipass isn’t important for some people to live a long and productive life, but the VNS is often the last chance these children have for a life at all. Christina may not be like other children, but she is just as entitled to living a long and happy life with her friends and family. She has had to climb an uphill battle since a very young age and could teach us so much about what it really means to live. She may not be able to get around on her own. She may not be able to enjoy a home cooked meal like the rest of us. And she may not have any formal method of communication, but she has feelings and she knows what’s going on around her. I know there’s not much I can do for Christina, but I’m hoping that by sharing her story and letting everyone know about the struggles she must overcome each day, maybe someone will stumble across my little place on the worldwide web and start bringing about change. There are so many children out there like Christina, but as of today they’re no longer alone in their fight for life because they have Monique on their side. Christina’s Mom is a strong woman and I know that she will never give up on her daughter because she believes, just as I do, that everyone deserves a chance at life. If you’d like to join us in writing letters to the Ontario Minister of Health, please leave your e-mail address in the comments section and Monique or I will contact you with the details. And what that is nobody knows. There are few foods that I will eat. Please help us advocate for Christina and children like her because if we don’t, no one will.